I recently read Kate Raworth’s Doughtnut Economics,and it was a revelation, one of those books that made me uneasy about some things I’d done/argued in the past, and – more importantly – gave me a frame for thinking harder. I last had a similar feeling almost exactly a decade ago when I read Resilience Thinking by Brian Walker and David Salt. Raworth’s book is a good primer for non-economists (like me) on the evolution, limitations and damaging effects of our obsession with growth and particularly Gross Domestic Product and its growth as the sign of health for our economy. She argues we need to reconsider the purpose of that economic activity, and well as the full cost of the activity – which has generally has left our use of the earth’s energy out of calculations, leading to the climate crisis we are in now, living as if there were more than one planet. She goes on to the eponymous doughnut to think about a ‘safe and just space for all’. 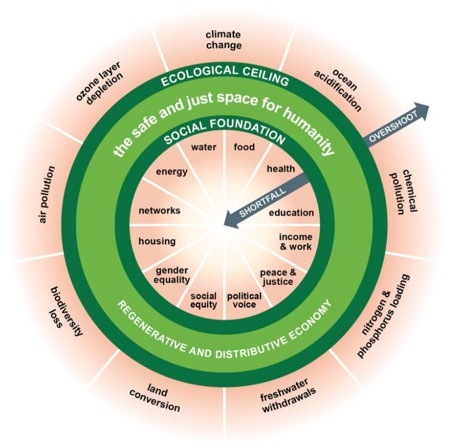 This has an ‘ecological ceiling’ made up nine ‘planetary boundaries’ such as biodiversity loss, pollution and climate change which we should not overshoot. There is also a social foundation of various aspects of well-being such as health, education and gender equality. Between these, Raworth argues, is where we need to live and work and keep our economy. I’d also had several conversations in swift successions recently about the hours worked in the arts above and beyond normal expectation, which struck me as some kind of parallel of our global overuse of energy and the earth. (Not that I think the sector is at all unique in this, btw.) So I got to wondering if anyone had even attempted a cultural or creative industries version of the doughtnut. An old-fashioned joy of Twitter – people actually responding to open wondering! – led to a coffee with Dr Jonathan Gross to hear about his work at Kings and to share a sketch of a cultural doughnut, which is below. It suggests overshoots might include overwork, low pay, gentrification and its effects, climate change, unethical funding and more, while the social foundations should include equity, networks, the right to fail, time, diversity and stability. This is very much a first sketch – and the number of elements is influenced by ease of ‘sketching’ – but feels like it mightbe able to iterate into something helpful for people thinking about the balances needed, the overshoots and shortfalls to avoid, when attempting to create a safe and just cultural sector within a safe and just broader culture. It could join up some dots or loose threads. It is undoubtedly wrong in some areas, missing others and putting some things unhelpfully or clumsily. One of my main uncertainties is the best equivalent of ‘a safe and just space for all’. Is it a cultural (creative?) economy, cultural democracy or simply culture? ‘Just and creative’? So I’m sharing it for someone – maybe you, dear reader? – to make it better for your own purposes, give me some pointers to do that, or gently advise me not to waste my train journeys in this way. You might even want to encourage (commission?) me, who knows. Raworth quotes George Box as saying that ‘all models are wrong but some are useful’. I know this is the former, I’ve only a hunch it might eventually be the latter. What do you think? 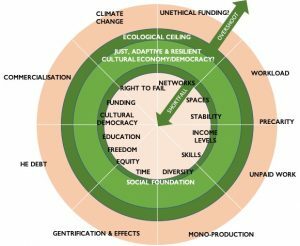 This entry was posted in Blog, Uncategorized and tagged culture, doughnut economics, funding, Kate Raworth, resilience. Bookmark the permalink.